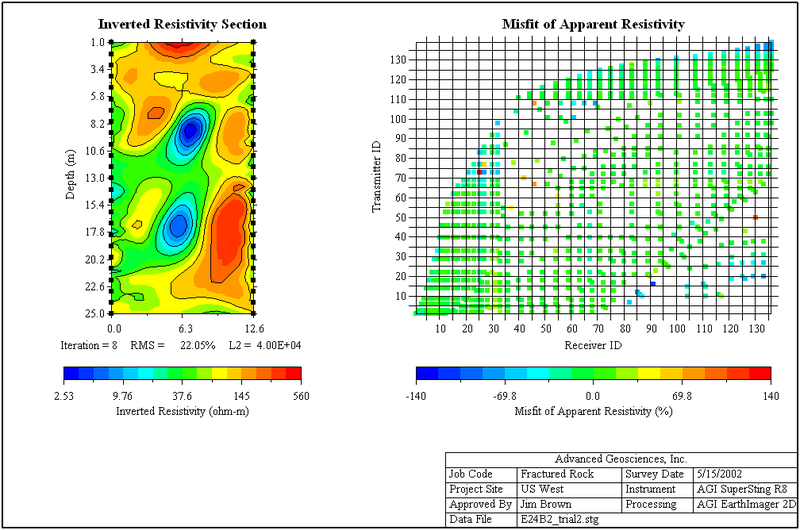 AGI EarthImager™ 2D is a two-dimensional inversion modeling software for affordable resistivity and induced polarization (IP) imaging. It interprets data collected by the SuperSting™ Wi-Fi in just a few clicks, including parallel boreholes or on a surface line. 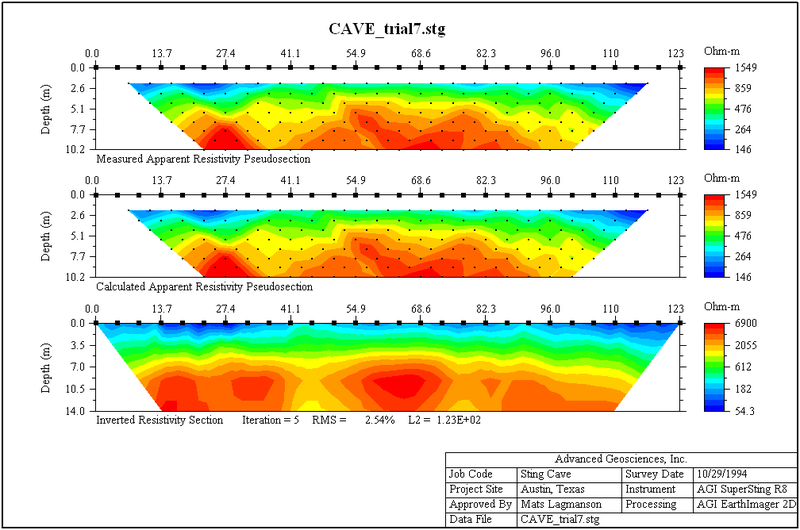 The data set, collected using SuperSting™ Wi-Fi earth resistivity imaging instruments, is processed into a 2D cross-section of the earth. The processed data can be output to various types of files and can be processed into reports ready for submission to the client. Any array or mixed data from Schlumberger, Pole-Pole, Pole-Dipole, Dipole-Dipole, or Wenner electrode arrays are possible to invert. 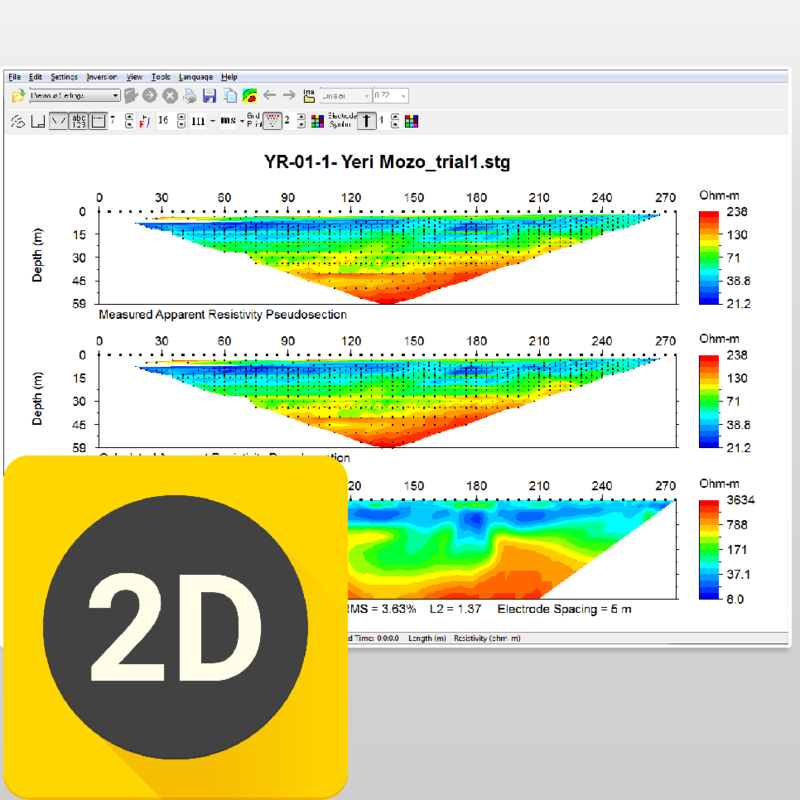 A special "Survey Planner" allows the user to enter a geological model and run a virtual survey and then invert the virtual data to see if the objective of the survey can be met. Determining the best location for a well in a rural, underdeveloped area—so the individuals in the surrounding area have access to safe and clean drinking water—is an excellent use of the EarthImager™ 2D. Drilling is expensive and drill maintenance is even more so, so if an non-governmental organization (NGO) decides to drill a new well, they need to know with certainty where to place it. By using EarthImager™ 2D, the ground water exploration team can create a tomogram that shows where the best location for a producing well is. 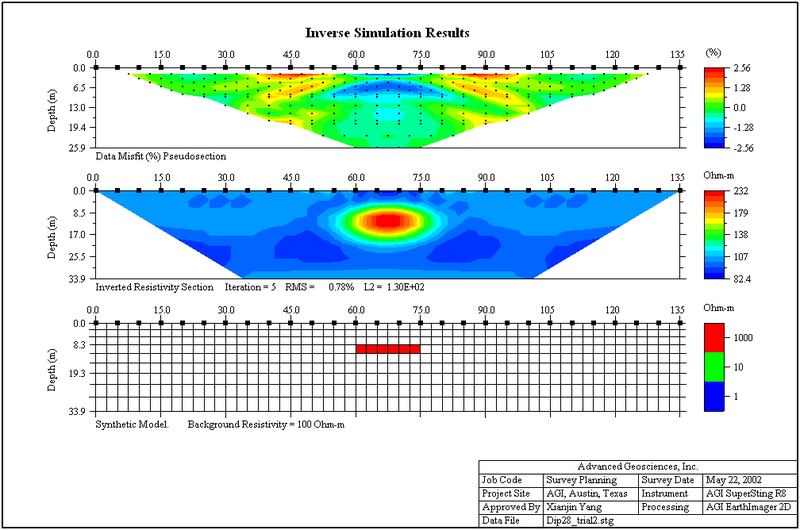 Survey planner with graphical model input, virtual survey with the actual command file, and inverse simulation with user-specified Gaussian noises. 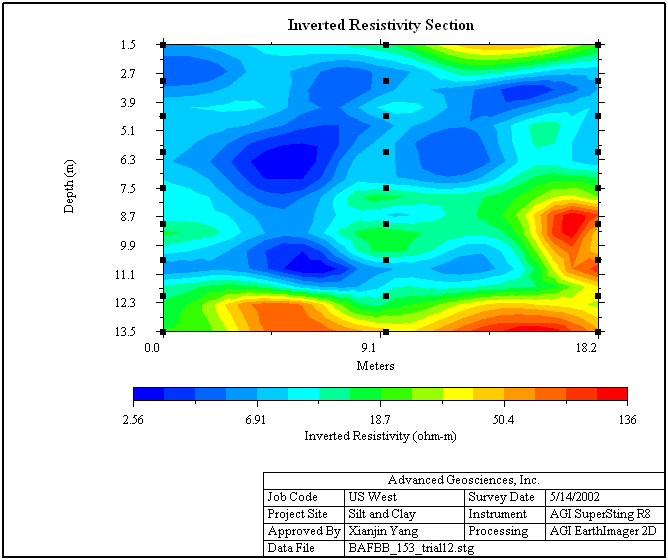 Topographic correction and printout of resistivity section with topographical features. 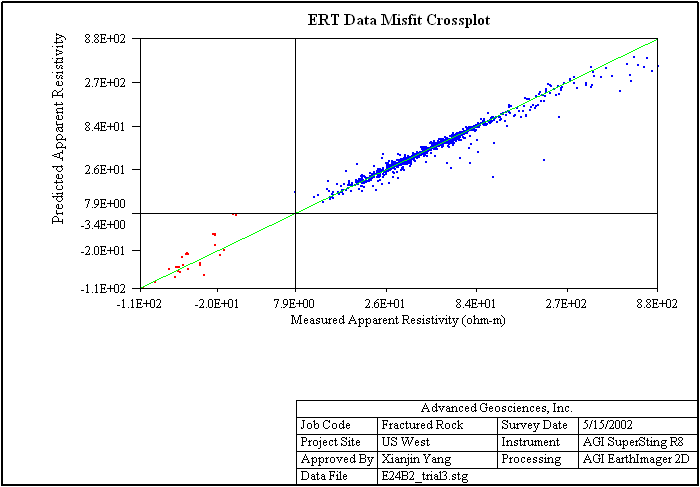 Data editing for detecting and removing erroneous data points and bad electrodes. No software limit on number of data or number of electrodes. 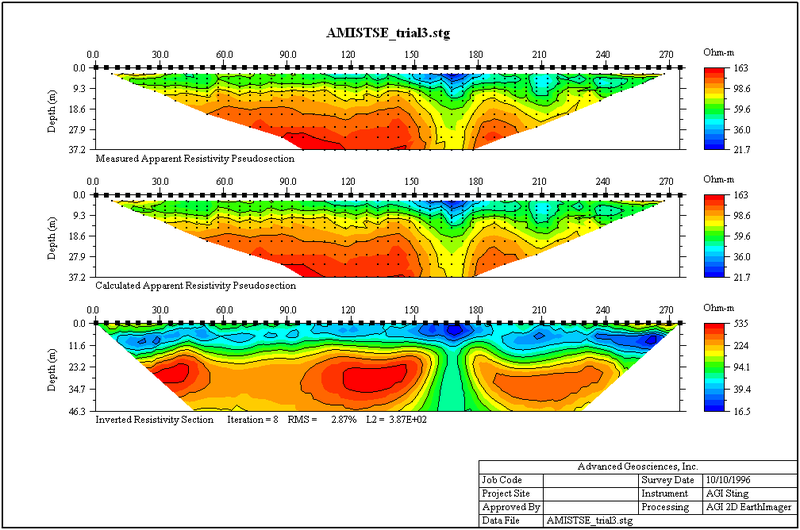 No limit on electrode array type or electrode location. Data misfit scatter plot and cross-plot. 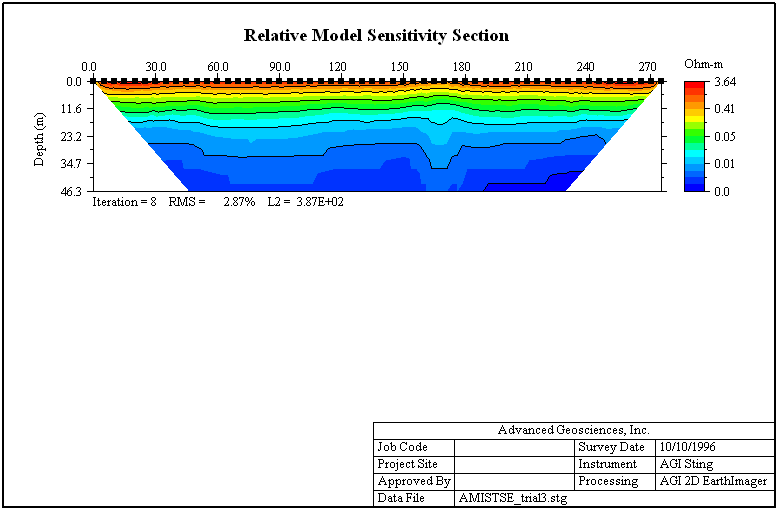 Reversal and horizontal shift of a profile. High-definition report quality plat-style printout. Batch inversion of many data files. Borehole command creator for AGI SuperSting™ instruments. Support of other instrument brands’ data file format. Finite difference and finite element forward modeling. Three inversion algorithms: damped least squares, smooth model, and robust inversion. IP data processing by linear inversion. Uses Gauss-Newton and quasi-Newton methods. Both root-mean-squared (RMS) error and L2-norm statistics to monitor the inversion progress and convergence. Windows TrueType font and true 24-bit color. Fast graphics with automatic refresh and scalable image. Real-time scrolling through all iterations using the mouse wheel, creating "movie-like" animation. A graphical a-priori information input interface. Removable contour curves and automatic blanking. Tool buttons and pop-up menus for easy access to frequently used menu items. Automatic file-saving feature with on/off options. Saveable as bitmap, JPEG, or Windows metafile files at three resolution levels. Check of computer memory status to estimate processing capability.